Set in the year 1999, we follow Detective Ben Walls as he leaves his young family and rushes to the site of a suspected terror attack. On arrival he and his colleague's sweep the building only to get caught up in a further explosion. He awakes in an eerily empty hospital with his friend and colleague captain Miller, a lost looking couple and a security guard. 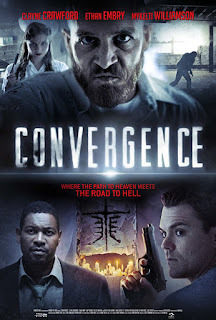 There are others in the hospital led by Daniel, a crazed religious madman, who has been recruiting lost souls to help him terrorise Ben and the others. Then there are the strange shadowy figures that appear and disappear which only exacerbate Ben's feeling that something is really not quite right in this place. There is a lot going on in this movie which can sometimes be a little confusing but it does get clearer as it progresses plus it has an awesome little tribute to a cult science fiction classic in the form of Ben's T-shirt that he wears throughout the movie, it's done very well so as not to detract from the plot. The cinematography and camera angles are very well done which intensifies the general feeling of unease and surrealism. Not overly gory but there are some suitably squirmy moments of torture and mutilation. For example: a great tongue being cut off moment. The acting from all the cast is great too! Ben (Clayne Crawford) and Daniel (Ethan Embry) are brilliantly intense characters. The quirky nurse Delilah (Chelsea Bruland) adds some fun elements to the mix with her 50's hairdo and cheery dialogue, blurting out "son of a biscuit" when startled, plus a few other random witticisms. Possibly a bit misplaced but I liked her and it keeps you guessing as to what is actually going on! Originally starting off in 1999 it does have some time shifting elements to it but don't want to give too much away. I really enjoyed the soundtrack too its very effective and flows really well within the movie. It is definitely one of the better supernatural hospital movies I have come across. It gets some mixed reviews with the bad ones really ripping into it which I feel is undeserved. Every element has been well thought out with dramatic execution. It's very watchable and I recommend you give it a go. I am quite intrigued to check out some of the director's other movies too.